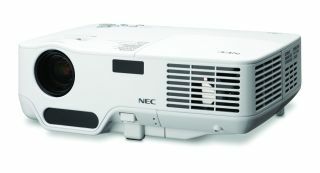 NEC Display Solutions of America announced the addition of the NP62 digital projector to its NP Mobile Series. The NP62 is designed for corporate, government and education settings, and includes Universal Serial Bus connectivity for use with a USB thumb drive, eliminating the need to carry a laptop. Images can be sent directly from a phone or computer using the Bluetooth adapter, which is optional. The HD-compatible NP62 comes on the heels of the NP41 and NP61 released in 2008. The lightweight, automatic NP62 provides bright and colorful images while remaining quiet in operation. The quick-start and quick-cooling features minimize setup and teardown times between meetings, and the automatic focus instantly provides a sharp, detailed image.